Before I had Hudson I swore, swore, I wouldn't let my kid's faces get messy. 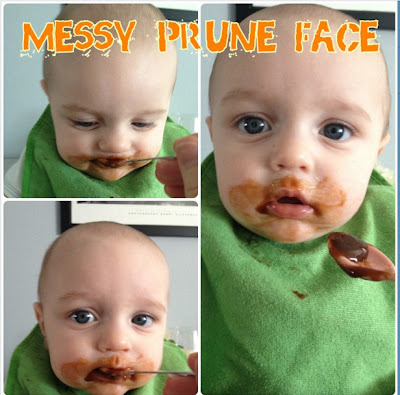 I couldn't understand how some mothers let their babies faces get all drooly, snotty, and messy. Now I understand, you just can't keep up. Be it spit up, drool or snot, their fluids are just a-flowing. I can wipe Hudson's face clean, turn around and the next thing I know he's covered in drool. Right now with his teething, Hudson seems to be wet all-the-time. I have to change his clothes a few times each day because he gets a wet drool spot down to his belly button every hour, and he has a bit of a cold right now, so he's just a mess, but I love him in all his drooly, snotty glory. So to all those mother whom I prejudged, I'm sorry.